My very dear merchandiser was turning 30. She is the ultimate chocolate lover. I wanted to do something special for her. It was a weekday. I need to keep it simple. This is a recipe originally from William Sonoma. I love how simple it is. In here I am showing you the traditional way to melt and chocolate and better. You can easily put the chocolate and butter in a large bowl and microwave for 60-90 sec. Stir well. It works just as well. Measure and cut a piece of parchment paper to fit the bottom of a 8" spring form pan. Please make sure the bottom of the pan fits tightly and it is not going to leak. Till the ingredients is combined, and smooth. Remove from the double boiler and let it cool. Separate 4 eggs - put the yokes in a small bowl, the white in a large bowl. Start beating the egg white with a mixer. 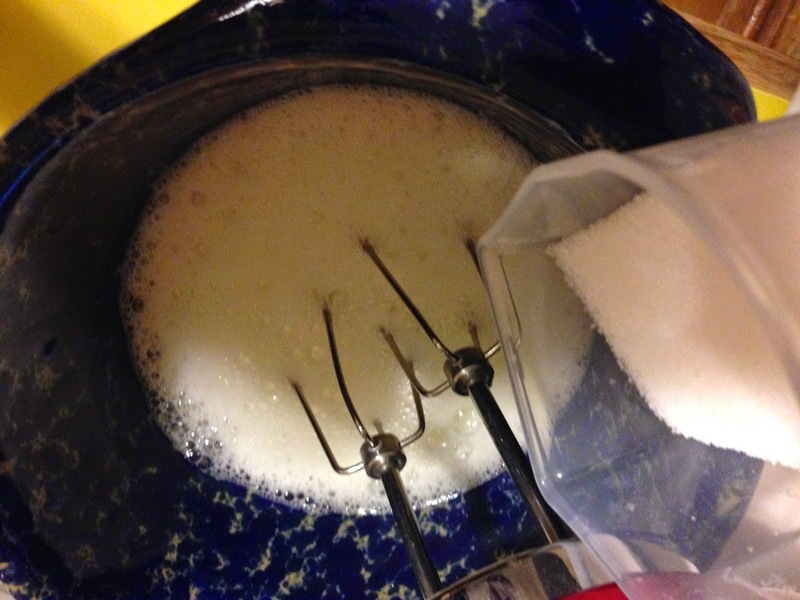 Once it starts to become foamy, slowly add in 1/2 the sugar, continue to whip the white. Add the other half of the sugar once the white starts to form some peaks. Remove from oven and let the cake cool in the pan. Transfer the cake to a serving plate. I love to serve the cake with a simple dob of whipped cream and a few fresh raspberry on the side. Muesli is one of my favorite breakfast even since I was a little kid. I remembered when I was a teenage, my father and I used to go to a Germany Sunday brunch in Hong Kong once a month. My father loved sausages, the different kinds of cured meat and ham. That was a big treat for him. My father raised me as a meat eater, I turned to the cheeses, yogurt, the bread and sweets and I would always have a large bowl of muesli with fruit. "Donʻt we have that at home?" my father would say. "Yes, but itʻs different when they fix it" I would answer. It was the same question and same answer every month for years. Years later, I finally found out what was the difference. I learned to prepare muesli the right way from my Taiko Sansei Marco Lienhard. Marco was from Switzerland and he was a member of the famous Ondekoza and lived in Japan for 14 or 15 years. He is one of the best Shakuhachi, Fur and Taiko master. He performs and teaches around the world. I am very honored to be the opportunity to study with him. My breakfast was usually prepared by our amah or Dad in the morning when I was growing up. They treated the muesli just as any cereal - pour it in a bowl and pour milk over it and during the winter month, our amah would cook it like oatmeal. She would also sweeten it with sugar. Marco showed me the right way by soaking muesli overnight with seasonal fruit. The flavor and the sweetness of the fruit infused the porridge. You can make it overnight. You have an instant breakfast in the morning. I would cook it for 2 min in the microwave in the winter and I have hearty hot breakfast. 3 - Dried fruit - I change the fruit quite a bit. Raisin is sort of my "base". I would have chopped dates if I want a more traditional taste. Cut up apricot is great during the summer and I love cranberry in the winter. I am a blueberry mode lately. 4 - Nuts - almond is always my "go-to" nuts. You can use any combination you want. I mix in some pecan at times. Walnut is great. I also like pumpkin seeds and sunflower seeds in the Fall. 5 - Milk - there are so many choices now. I am making a non-dairy version. I am using soy. Almond milk, coconut milk (non-dairy alternative, not the canned) are great options too. You can also go with milk. If you making Bircher Muesli - it is with yogurt and some milk. Dried fruit - raisin, cranberry. Fresh fruit: Chopped apple and I always have banana. 1/2 cup sliced almond - lightly chopped into smaller pieces. Spread 1/2 cup of the wheat bran on tin foil on a baking sheet and toast it in the oven. This will bring out the nutty flavor in the grain. Toast the grain for about 5-10 till itʻs lightly golden. Store in an airtight jar. Make 4 cups. You can keep the porridge in the fridge up to 48 hours. It is best prepared overnight and I found it taste even better the 2nd day: This make about 3 serving for me. Additional fresh fruit as topping. 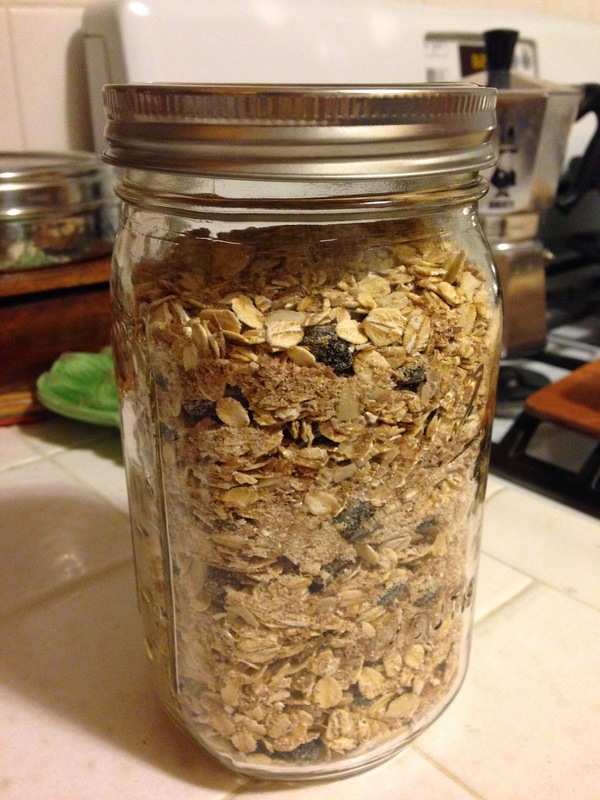 Use a plastic or glass container with a tight cover. Mix well, cover the porridge and let it sit in the fridge overnight, up to 48 hours. Stir the porridge, if it is too thick, add more milk to your taste. At this point you can transfer the amount you want to a microwave safe bowl. Cover and heat for 1.5-2 mins to have a hot breakfast, or this can be served cold. Top with additional fresh fruit of your choice. Miso braised daikon with beef short ribs. It is daikon season here in Southern California. I have never see daikon this fresh and beautiful. The only issue I have with these guys - they are a bit on the oversizes. I love daikon in soup, however I am soup out. I need to do something other than soup! My dear "sista" Shoko and her mom visited me last month. 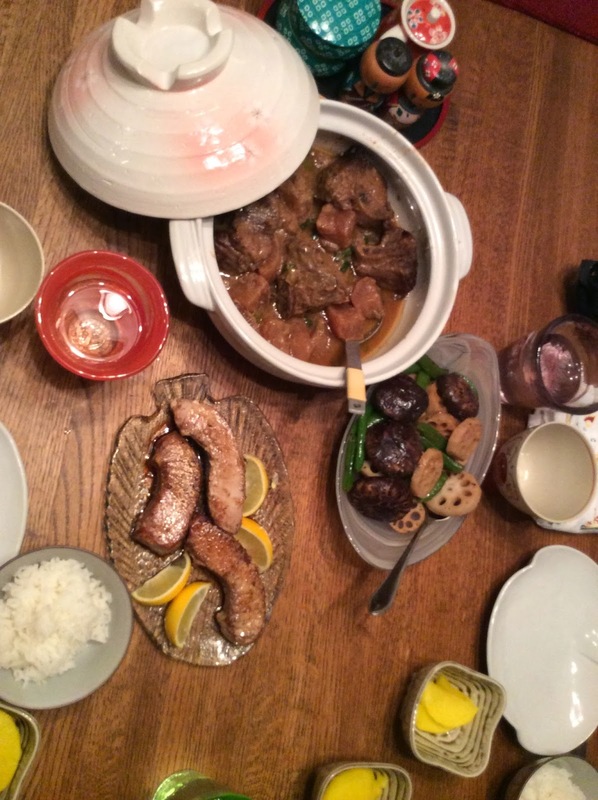 I wanted to have something ready for dinner, I decided to braise the daikon with miso and some beef short ribs. This is a relatively simple recipe and it freeze very well. I made this a week ahead, freeze it, then reheated it for dinner. Shoko loved the dish! 4 pieces of beef short ribs or country ribs, with or without bone. 4-5 green onion. Cleaned and chopped. Reserve 2 tbsp of the green part for garnish. In a small bowl, mix miso and mirin. 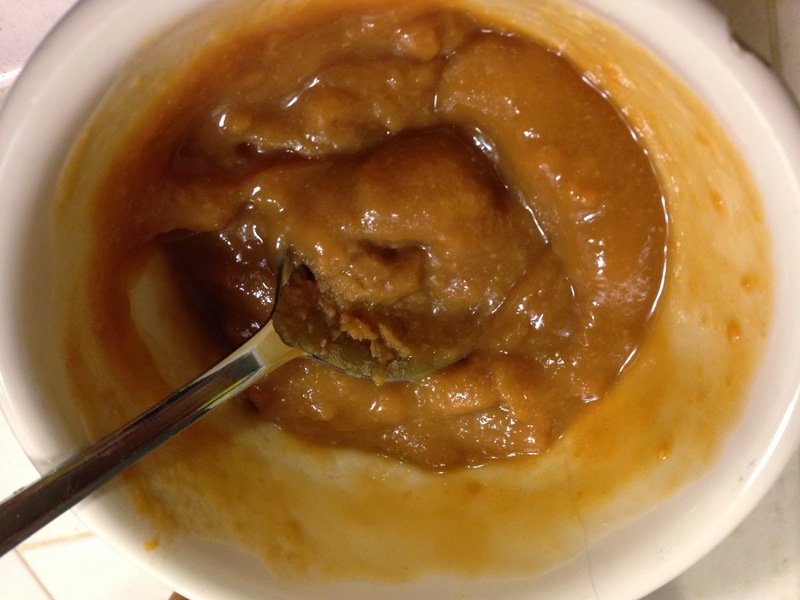 Blend miso with mirin together till it is no longer lumpy. In a wok or large fryer, heat 3-4 tbsp of vegetable. Add ginger and garlic. Cook for 1-2 mins. Brown ribs in the hot oil. Add green onion. Let it cook for 2-3 mins. Fold in the miso mixture. Coat the vegetable and ribs with the mixture. Bring the stew to full boil, then lower to medium low. Cover and let it cook for about 1.5 -2 hours till the ribs are tender. Check the liquid level, add more stock if needed. 1 - Plate the dish, drizzle with a little sesame oil and garnish with some green onion. 2 - Let it cool and put into a storage container and freeze.